Shahin Farhat's "Iranian Suite" and "Iranian Rhapsody" are, apparently, the first recordings by the Tehran Symphony Orchestra since the 1979 revolution. Commissioned by the Music Society of Iran, they were both offered on one CD last year. This is another indication that music is becoming a more acceptable part of Iranian society. Persian classical music has been thriving in recent years and now, Western classical music -- with Iranian tones -- is showing a strong presence. Farhat, who has studied music extensively in France (Sorbonne and Strassbourg) and the U.S. (New York), has several other pieces to his credit. But this latest work has been inspired by Persian classical music, specifically "radif" music, he says. 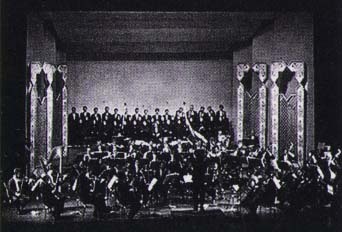 The Tehran Symphony Orchestra is conducted by Fereydoun Nasseri.